I came home from the beach one Sunday afternoon, and Maggie was sitting on a planter box outside my condo just looking at me. She started meowing at me as soon as I got out of my car and followed me to my front door. She was extremely thin and quite persistent. I brought food and water out to her and sat with her like I did with Tasha. I fell in love immediately and took her to the vet to get tested the very next day. I couldn’t imagine how such an affectionate cat was homeless, and then the vet said she was already spayed. Surely she belonged to someone. I walked Chance all over our neighborhood and beyond and didn’t see a single flyer looking for a missing cat. I was sad for her, but grateful that she found her way into my life. Knowing what I know now about cats, I was extremely lucky when I brought Maggie inside. I had no idea that there was a process to integrating cats in a home – I just brought her right in. Maggie turned out to be a bit pushy and had no problem moving in and making a place for herself. Truthfully, I kept waiting for something to go wrong, for her to get sick. I certainly wasn’t hoping for it, but I never had a truly healthy pet before and I assumed it was normal. Year after year I took Maggie for her annual exam and nothing bad happened. My vet finally told me to stop worrying because Maggie was perfectly normal, what a cat should be like. I felt an instant rush of relief and continued to enjoy my one healthy pet. Then Maggie started losing weight and acting strangely shortly before Tasha passed. She was running around like she was crazy and eating everything she could get to, but continued to lose weight. There was no calming or appeasing her. 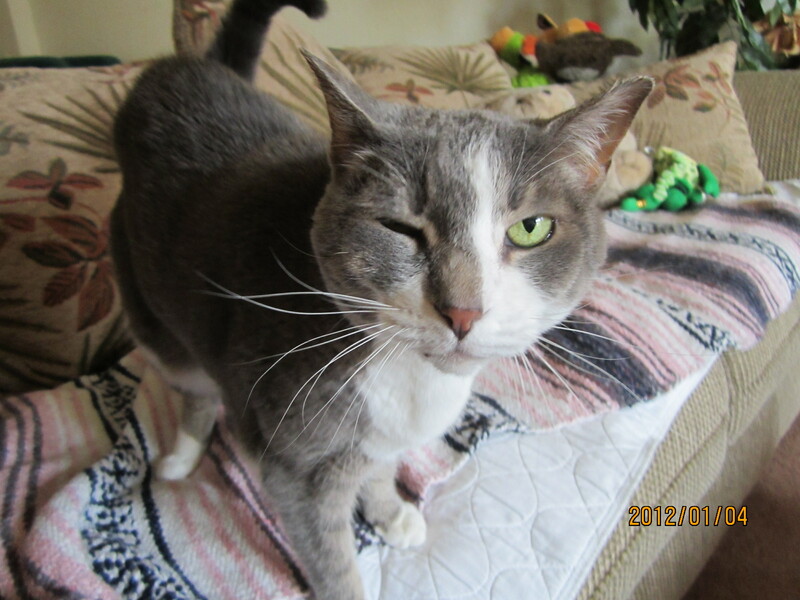 Maggie was diagnosed with hyperthyroidism. I didn’t love the treatment options but settled with a topical cream to be absorbed through her ears. She was doing really well, gained some weight back and her blood work was good. In November 2012, I had the vet check the skin on her ears just to make sure the skin was staying healthy. A heart murmur was found while performing the physical exam. Ugh! I took her to the cardiologist and it was decided that the murmur didn’t require medication at this point. I was silly enough to think we were out of the woods. Maggie started losing weight again and by February 2013 she was so thin you could see her bones through her fur and I was starting to panic. I didn’t think I could handle losing another one so soon. Maggie received an abdominal ultrasound, and the concerns were either Inflammatory Bowel Disease, Small Cell Lymphoma, or Lymphoblastic Lymphoma. The blood results kept leaning toward cancer, but I couldn’t bring myself to put her through the recommended biopsy. There were too many risks involved. Two additional blood tests were recommended and if the results were elevated it would most likely be cancer. I was prepared to make the same decision that I had for Tasha. I was not going to put Maggie through chemo, which is why I passed on the biopsy. Well, the blood results were not elevated, thank God, and we started treating Inflammatory Bowel Disease. Treatment required stripping her diet down to a single protein and a single carb. Maggie is now on a Limited Ingredient Diet (LID) and the results have been amazing. She’s gained her weight back and her fur is gorgeous – she’s back to normal.